Banbury Cross Farms, primitive charmers featured by the BBC, Nat Geo, and ETV, are proving to be extraordinary therapy and service dogs. If "That looks just like MY dog!" 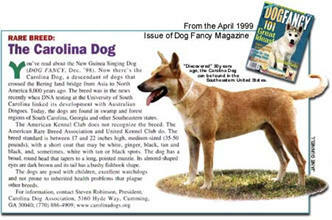 is your first reaction to the photos, then perhaps you're fortunate enough to own a living piece of history... a CAROLINA DOG ...also called the American Dingo, the Dixie Dingo, the Southern Dingo, the Native American Dog, the Indian's Dog, the Southern Aboriginal Dog, and just plain Ol' Yaller Dog! But what, exactly, is a "Carolina Dog"? During the last 30 years, the capture and study of free-ranging dogs in remote areas of South Carolina and Georgia has revealed the existence of dogs of primitive appearance fitting the typical long-term pariah (i.e, primitive/dingo) morphotype. These Carolina Dogs physical appearance suggests a dog created by and preserved through natural selection to survive in the remote lowland swamp and forest land regions of the southeastern United States, They closely resemble types of dogs first encountered by Europeans near Indian settlements in the region as is evidenced by paintings, drawings and written descriptions made by these early explorers and settlers. 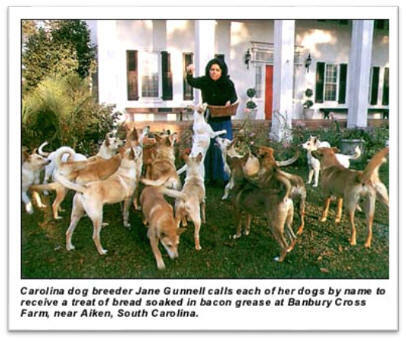 These Carolina Dogs have been brought into a captive breeding program. Several behavioral traits have been discovered that appear unique to these Carolina dogs, and many behaviors labeled as primitive are consistently manifested. Such behaviors include pack hierarchy, communal pup rearing, regurgitation for pups, and organized, cooperative hunting. 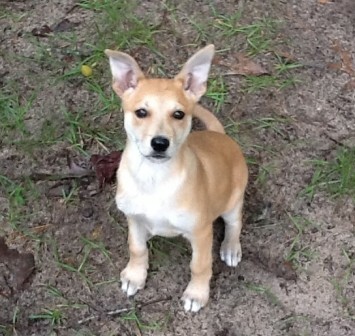 Preliminary mitochondrial DNA testing performed by the University of South Carolina's College of Science and Mathematics shows a possible strong genetic link between Carolina Dogs and other primitive breeds like the Australian Dingo. Now there is a definitive study released after 4+ years of study and testing by the Royal University of Stockholm. 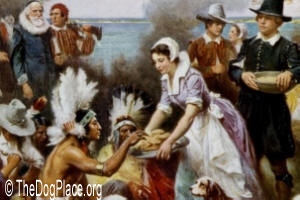 CD/ADs are the original canidae of North America going back 30,000 years, they accompanied Paleolithic man and later Indians. Please remember that Carolina Dogs aren't like other breeds! They are very different and must live as part of a gentle, loving family. Do your research, and read the CD/AD book. Also, realize that these dogs require much human interaction and are family dogs, not kennel dogs. Because they are gentle and kind by nature, they must have an abundance of love and attention and be a true part of your family to thrive. CD/AD's respond beautifully to positive reinforcement. Cruel treatment and harsh training methods will break their hearts and their spirits. They will excel in every venue with positive, loving treatment. They make extremely loyal, loving family members. They train themselves and relish outdoor activities. You can find many of our fantastic CD/ADs in the USA and all over the World with their carefully chosen families. They fly with their people in their jets, trek for miles across our beautiful country while their families ride horseback, travel on yachts and fishing boats, win thousands of ribbons and trophies, they find lost children, cheer up patients in hospitals and nursing homes as great therapy dogs, use them as certified companion and service dogs for their owners who are prone, for instance, to falling unconscious without warning --- our fabulous CD/ADs can warn them ahead of time to sit before they fall preventing further injury. These CD/ADs wear their blue vests proudly and are welcome in any public place. The amazing list of CD/ADs, their accomplishments and their proud owners goes on and on!! Now our CD/ADs are working with autistic children in their reading programs in the schools with a high degree of success. The next program being considered for our CD/ADs is working in the court systems with children who must be witnesses. As a result, there are articles about our remarkable CD/ADs in publication here and around the world almost every month. Check out the National Geographic’s “In Search of the First Dog” #1 or BBC's “From Mammoths to Manhattan” #2 (CD/AD at about 13 minutes of 49 minute video) Much of those films include our CD/ADs. The September '06 issue of Dog World Magazine - featured our dogs. 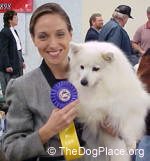 Our CD/ADs have been filmed extensively by BBC Worldwide and PBC/ETV and featured in their documentaries as well as featured in The Smithsonian Magazine#3 and hundreds more newspapers and magazines like; Southern Living which ran an article and pictures#4, Dog Fancy with Martha Stewart and her dogs on the cover ran a feature#5. Dog World, The Charleston Magazine, and the Wilmington News Paper just to name a few. You may want to call the top CD/AD trainers in the world, Jackie & Rick Lancaster! They are located in Mississippi and can be reached at (662) 781-7818. 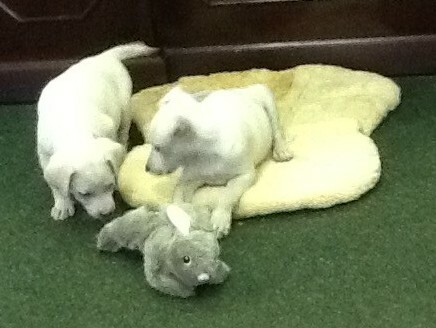 To learn more about the Carolina Dog, check out my new Book available on www.carolinadogs.com. Email or call 803-215-6164 (Jane Gunnell), 803-215-6166 (Billy Benton) or for the office of Fox and Hound (803) 649-0045. Look forward to hearing from you. "There's NO PLACEBO effect in animals!" If it helps dogs, it will help you. Explanation of why the dog closest to the breed standard may lose. Breeders on what makes their breed unique in their respective bloodlines.